Waiting for Jacob and Recipes!! Cheesy, Spicy Corn – sweet corn with Velveeta and jalapenos – add 1 cup of milk to the drained corn (I use about 5 cans). Then chop up the Velveeta, adding several chunks at once. Keep stirring and adding Velveeta until it’s nice and thick. Add chopped up jalapeno slices to taste. Here is one of the dresses that I made this week. I want to help Pam out in her quest to make 100 dresses for girls in South Africa. 100!! My goodness!!!! Oh, my goodness! I have SOOOOO much to do!!! I guess I had better get started! Anyone want to volunteer to clean my house??? Anyone??? No?? SIGH… Then I had better get off of here and get busy. We made coffee filter snowflakes with teal glitter for a special friend of ours. Then we played with homemade air dry clay with added cinnamon. Then we made peanut butter blossoms! YUMMY!! Then it was Christmas morning! I hope you all had a very merry Christmas!!!! Our Jacob will be here this weekend! We can’t wait!!! YAY!!!!! life? Here’s your chance. Today 12 bloggers are inviting you into their homes to be a fly on the wall. BakingInATornado.com – The Master Mind! If you were a fly on the wall in my house over the past month here are just some of the things you may have witnessed…. Joshua- If you had a metal bucket on your head and someone threw lit firecrackers under it, would it kill you?? Me – I realllly need to go on a diet. Deanna – I think we have a mouse. But I haven’t seen any mouse holes. Deanna – Yeah, you know, like on Tom and Jerry??? Me – You realize that is a cartoon, right? Deanna – You mean they don’t really live in mouse holes? Me – I don’t know whether to feel sorry for it or…..
Joshua – Kill it with fire???? Joshua – I was hiding behind the couch (hee hee hee) and Deanna didn’t know it (hee hee hee). She walks in (gasp, hee hee hee) and says to Cloud, “Kitty got gas! Yes, you do!” Bwha ha ha ha ha!!!! He then proceeded to laugh so much that I feared for his sanity. You would have heard me saying a few choice words every time I burnt myself with the glue gun or when my sewing machine would act up. Both of those things happen WAY too often. You would also have witnessed the new house trying to KILL ME!!! My goodness!!!! Here is where the garage door fell. Yes. It just FELL! Thankfully no one was hurt and the van was outside!! And here are all the books and the shelf that fell on top of my head! I had to dig my way out of them after yelling for someone to help me…. Concussion city! And yes, it was nailed into the wall! Sooo, I think the we have made peace with the house… Either that or it is trying to come up with another plan to oust us since the near death experiences haven’t worked so far……. I had a nice loooooong list for this post and then I ….ummmm…. lost the list… SIGH… And I will probably find it the after this is posted. 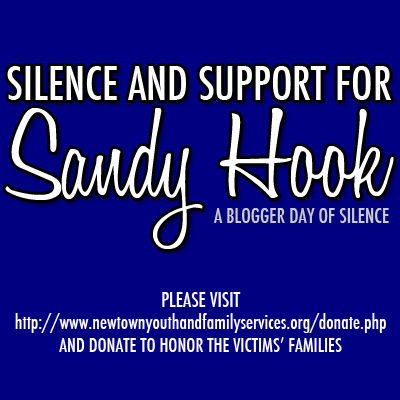 My VERY VERY GOOD friend, Eileen, just started her own blog!! WOOO HOOO!!! I hope you all go over and show her some love!! 15 brave bloggers picked a secret subject for someone else and were assigned a secret subject to interpret in their own style. Today we are all simultaneously divulging our topics and submitting our posts. It was a normal, average day. Blitzen was flying in to work when all of a sudden a bright, red light blinds him! He was so disoriented that he flew right into Comet. Yep, it was Rudolph’s nose again. SIGH…. Down Blitzen and Comet went, crashing through one of the workshops and landing in a heap on a pile of Furbys. Don’t worry, no one was seriously hurt and those stupid Furbys would still be making it down chimneys on Christmas Eve, unfortunately…. 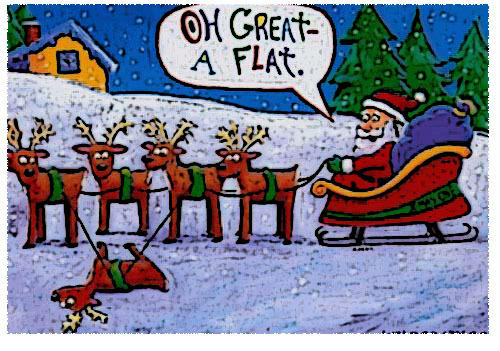 With his pride and rump bruised, Blitzen went home to get….well…. blitzed.. Seriously, with that name, you can’t blame him. 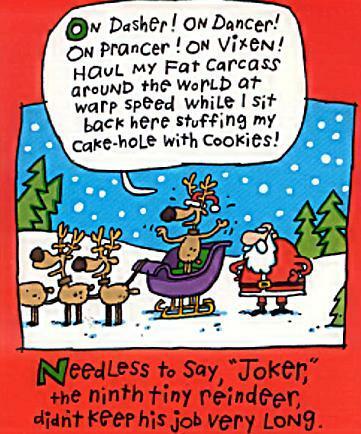 A while later, Blitzen’s wife, Doereen, comes home to find him in a state…. Then she starts complaining; her mother never DID like him, how are they going to make up for that day’s pay, and the BIG ONE, why can’t he be more like Rudolph????? That was IT! He had had enough! And that is when The Plan began to form. The Plan, just thinking about it made Blitzen snort with laughter! He would get even with that Goody Red-Nose! 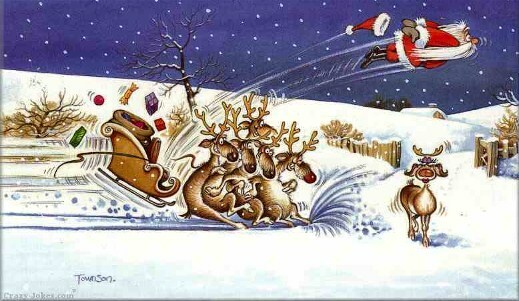 Have you ever seen what happens to a FLYING reindeer when they get the runs…. Well, let me assure you, it ain’t pretty…. Pigeons and seagulls have NOTHING on them. 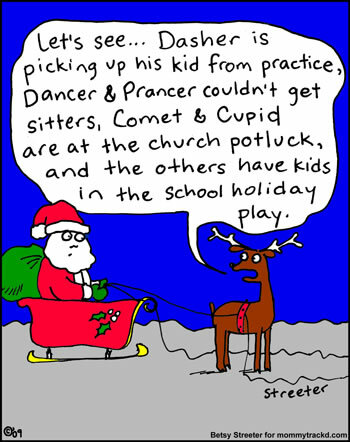 And have you ever seen what reindeer…. um….. pooh can do to a red suit?? Well, Santa found out. And being Santa, he knew exactly the who and the why. Now, don’t forget to go check out the rest of swappers!!! I am busier than I don’t know what! LOL YAY!!! I have my 2nd paying customer! YIPPPEEEEE!!!!! My cousin has hired me to make pajama pants for her and her boys. Here’s the 2nd pair in progress. There will be a bit of a surprise with this pair. 😉 It was a one directional print soooo I wasn’t able to make them as long as I would have liked (I like to make them a little big JIC). So, luckily I had some Hot Wheels fat quarters on hand and I will be adding cuffs for extra length. Look at this GREAT flannel my cousin picked for her pj pants! LOOOOVE it!!! As well as paying me for the pants she sent me this. So, the pj pants are my current project. So, that is what I have been up to!! If I’m not mistaken it should almost be time for another Fly on the Wall, too…. Just wait until you see what has been going on around here. Oh, my!!!! And we have been invited to The Hubby’s boss’s house for a Christmas party. DH is very…. ummmm….. welll… NOT social. Not exactly ANTIsocial but he definitely doesn’t LIKE it. AT ALL. So, here I am trying to convince him that we HAVE to go. This is not a social occasion that is taken lightly in The South…. LOL Heaven help me! !